Pingu’s English is an industry-leader in early childhood development; who have successfully pioneered a teaching model that develops early bilingualism in the English language. Pingu’s English is a global brand from Linguaphone Group Ltd, a world-leading training provider from the UK with over 115 years of experience in the international education market. As our exclusive Pingu’s English Master Franchisee, you’ll have the exclusive nationwide Master Franchise rights to capitalise on the lucrative pre-school English language training market all year round, using two separate programs, both based on the enormously popular animated TV character Pingu. ♦ A brand new, three-year full-time international kindergarten curriculum, which is delivered in English, helping achieve bilingualism before children start formal education. This engaging and comprehensive program is developed in co-operation with Kingston University, an international leader in pre-school English education from the UK. ♦ A three-level international English language training (ELT) program for 3 – 7+ years, aimed at stimulating a child’s confidence in the English language, through an effective play-based curriculum. Pingu’s English already has a global presence in more than 20 countries worldwide, including in China, Thailand, Brazil, Saudi Arabia, Palestine, Italy and new MENA-region Master Licensees launching in Algeria and Iraq in the months ahead. Pingu’s English offers a unique combination of a fun and solid learning experience, delivered in an engaging, safe, and vibrant learning environment. Through both our highly respected pre-school English program, and our brand new international kindergarten program, Pingu’s English offers parents a recognised, premium and respected international curricula. 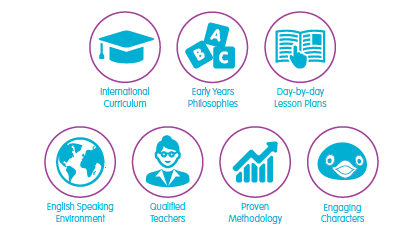 And to ensure the consistency of our proven method the world over, it is delivered worldwide through qualified teachers and day-to-day planned activities. “We were attracted to working on this unique project with Pingu’s English and Linguaphone Group Ltd, as we believe that early years’ education can make the biggest impact on the learning of young children. What makes Pingu’s English programs unique in the market? Our qualified Pingu’s English teachers follow day-by-day lesson plans built on key milestones in our students’ social and academic development. Pingu’s English international kindergarten program is the only curriculum worldwide to have day-by-day lesson plans to ensure consistency of its method worldwide. During their time with Pingu’s English, our students will develop well-rounded skills in reading, speaking, writing and understanding in English, alongside academic skills such as maths, and broader social skills such as team work, communication and confidence to prepare them for formal education. Pingu’s English international curricula have strong learning outcomes throughout. Certainly we would expect that our students should reach a level of English proficiency which would enable them to sit the Cambridge Starters Exams, equivalent to an English proficiency level of A1 on the Common European Framework. Linguaphone Group Ltd already has a strong tradition of working successfully across the MENA region with their internationally respected Direct English language training program for adults. Now, as part of our ambitious global expansion plans for the year ahead, we’re looking to appoint strong, new exclusive Pingu’s English Master Franchisees across MENA, who are keen to develop a long-term successful franchise partnership with us. We’re looking for ambitious and driven partners to work with us under license to develop a nationwide network of branded Pingu’s English Schools in their territory. You will have both the flexibility to run your own business, whilst at the same benefiting from all the support you’d expect of an established global brand like Pingu’s English. And as the exclusive Master Franchisee in your market, you’ll have access to both of our international programs to reach the lucrative pre-school education market – both our new international kindergarten curriculum as well as our popular pre-school English language program. Do I need to have previous experience in the education sector? Whilst it’s important that you share a passion for education, it’s not necessary to have previous success in the education sector to become a Pingu’s English Master Franchisee. Indeed some of our strongest partners across the Pingu’s English global network are investors and entrepreneurs from other sectors including hospitality, real estate oil and gas, who had no prior education background before joining us. The chance to generate anexciting monthly income with a worldwide proven system that works. Ongoing support in sales and marketing to help you generate new clients and Unit Franchises leads, including: Marketing campaigns, collaterals and branding, as well as Operational Manuals for your team and exclusive access to the Online Portal with all teaching, business and marketing resources available 24/7. Ongoing and unlimited business development support from a dedicated and experienced Business Development Manager including regular in-country visits. A comprehensive in-country two-week training programfor both teachers and senior management. Networking opportunities and support from Pingu’s English Master Franchisees worldwide through annual conferences, webinars, and forums. An investment without competitorsin the market, especially with the new international kindergarten project: the first and only international kindergarten program worldwide to have a proven method with day-by-day lessons plans for teachers. Builds confidence in the use of English from an early age. Uses a wide range of multimedia learning and support materials. Develops fundamental creative and educational skills. Includes a wide range of fun learning activities. Provides the only English language course based around the lovable and award-winning Pingu. Pingu’s English is now expanding regionally & internationally and has identified the MENA region as the priority market for immediate development. We are looking for qualified and capable franchise partners to develop the brand in the MENA countries and beyond. If you are serious about setting up a quality franchise business, then we want to hear from you! Pingu’s English is the educational, fun and effective children’s English language training franchise from the UK that creates students who are ready to start school, engaged with the world around them, and speaking English fluently. We’re looking for strong, new Master Franchisees to join our growing global network with all the training, marketing and business development support you’d expect from a British company with over 115 years of experience in the language training market!